We are accepting nominations for the prestigious LACBA Real Property Section Outstanding Young Lawyer Award. If you have an attorney in your firm or have worked with an attorney who is exceptional at the practice of law and giving back to the community, please send the following to Linda Spiegel at lespiegelesq@cs.com: nominee's name, position, year and reasons for the nomination. Nominations must be received on or before November 30, 2017. For the Outstanding Young Lawyer Award criteria, click here. 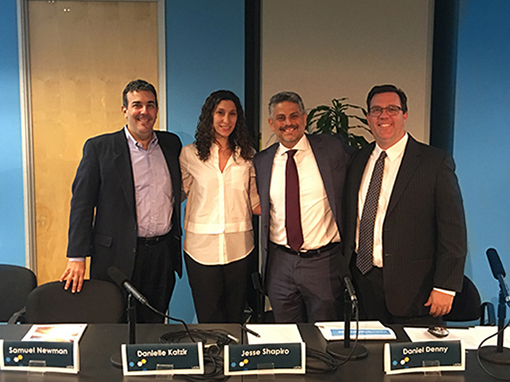 Sam Newman, Danielle Katzir, Jesse Shapiro and Daniel Denny (pictured left to right) of Gibson Dunn put on an outstanding presentation on the bankruptcy rules behind today's real estate mortgage lending structures for the Finance Subsection on October 18. Stay tuned for more exciting programming from your Real Property Section. Please join us for a lively discussion on complying with federal and California state statutes/laws that protect borrowers/debtors in non-judicial foreclosures. LACBA Real Property Outreach Committee cordially invites you to a happy hour book talk from 6:00 p.m. to 8:00 p.m. on Thursday, November 16, 2017, with Leslie ("Les") Klinger. All roads in construction claims lead to damages. Whether you represent owners or contractors, dollars represent the end game. California, which led the way in medical marijuana issues, has recently joined a handful of states that permit recreational marijuana. Given that marijuana is still federally illegal, California attorneys are faced with a growing number of ethical questions about whether to represent cannabis-related clients and how to effectively do so while abiding by the California Rules of Professional Conduct. Join us for a panel discussion with a wide range of practitioners about these issues. The state Department of Pesticide Regulation's pesticide registration program is exempt from California Environmental Quality Act chapters 3 and 4, as well as Resources Code Sec. 21167, but it otherwise remains subject to the broad policy goals and substantive requirements of CEQA. The department's public reports on the lack of significant adverse environmental impacts were so inadequate as to render public comment on the reports meaningless where the reports did not describe potential alternative courses of action, failed to identify an environmental baseline, and did not contain a cumulative impacts analysis. When a party seeks to establish the applicability of the unusual-circumstances exception to the California Environmental Quality Act, it must prove that the project presents unusual circumstances and that there is a reasonable possibility of a significant environmental effect due to those circumstances. A court then assesses the agency's determinations on these elements by applying a deferential standard in reviewing the first element and a non-deferential standard in reviewing the second. A court cannot affirm an agency's implied determination that the unusual-circumstances exception is inapplicable by simply concluding that the record contains substantial evidence that the project involves no unusual circumstances. To affirm such an implied determination, the court must assume that the agency found that the project involved unusual circumstances and then conclude that the record contains no substantial evidence to support a finding that any unusual circumstances exist or a fair argument of a reasonable possibility that any purported unusual circumstances identified by the petitioner will have a significant effect on the environment. The possibility of foreseeable First Amendment activity does not establish the applicability of the unusual-circumstances exception because the activity might lead to an unsubstantiated and ill-defined indirect or secondary environmental effect. A military contractor should not have been assessed with 100% of the cost of cleaning a contaminated site. The government had required the use of chemicals known to be hazardous, the company maintained compliance with the prevailing environmental standards as they evolved over time, and the government repeatedly agreed to share in the company's environmental cleanup costs over the course of more than 20 years. The expiration of a previous conditional use permit changes the permitted use of a property under the zoning code, but not the occupancy classification under the California Building Standards Code. A property owner who voluntary remediates hazardous condition on his property can seek indemnity for his response costs under the Carpenter-Presley-Tanner Hazardous Substances Account Act. The owner's voluntary participation in the Assembly Bill No. 2061 process does not preclude such recovery. The Comprehensive Environmental Response, Compensation, and Liability Act's consumer product exception applies to consumers using consumer products, not commercial properties used by consumers. Nevada Revised Statute Sec. 40.459(1)(c)--which limited the ability of a third party to profit by purchasing real estate debt at a discount and foreclosing at full price--is pre-empted by the federal Financial Institutions Reform, Recovery, and Enforcement Act of 1989, as applied to transferees of the Federal Deposit Insurance Corporation. A bank's oral promise to grant a debtor time to come up with a payment plan did not form a contract when there was no exchange of consideration. While estoppel can apply to a promise for which there was no consideration paid, estoppel is inapplicable when the allegedly injured party could not have reasonably believed that the bank would have given it infinite time to put its affairs in order. Nevada law allows the holder of a secured debt to institute a deficiency action for the lesser of the difference between the amount of the debt and the fair market value of the property at the time of sale, or the difference between the amount of the debt and the actual amount for which the property was sold. Parties to such an action are not entitled to a jury trial on the fair market value of the property at issue. The Alaska National Interest Lands Conservation Act does not prohibit the National Park Service from prohibiting the use of hovercraft on a stretch of the Nation River that runs through the Yukon-Charley National Preserve because the United States had an implied reservation of water rights, rendering the river public lands.